We just wrote about the power of the volunteers who have worked on Haiti. However volunteers are not only useful in times of crises. Digital Democracy’s core team is small, and we accomplish our work through partnerships and collaborations. Our volunteers and interns play a crucial role, and today we want to highlight the work of two of our current interns who are helping to make Handheld Human Rights a success, mapping decades of information on human rights abuses in Burma/Myanmar. Niki Jawerth has been working with us since January, and in that time has transformed from an Ushahidi novice to our Human Rights Cartographer in Chief. Focusing on Handheld Human Rights, she has single-handedly entered hundreds of human rights abuses into our Ushahidi map and has helped refine the material we use to train others. In addition to working with us, Niki is a graduate student at the School of International Service at American University. She is seeking a Masters degree in Ethics, Peace, and Global Affairs with an emphasis on human rights and social justice. As a Swedish-American, Niki has utilized her international upbringing to her broaden her knowledge of human rights, and she hopes to impact the shaping of the global human rights framework in the future. It was her interest in Burma that brought her to Digital Democracy, and through her work with us she has been able to marry her passion for human rights to her background and excitement in technological innovation. Her internship with Digital Democracy will formally end this summer when she heads to Brussels, and we are excited to see how she will continue to leverage technology to promote international human rights. Dragana Kaurin also got involved with Digital Democracy in January, responding to our call for help developing Ushahidi to track human rights in Burma. She has since worked on Handheld Human Rights as well as helped with our Haiti work, focusing on researching the status of Haitian women. Originally from Sarajevo, her family came to the US in the mid-90s as refugees. She recently graduated from Ohio State University with degrees in Arabic Language and Cultural Anthropology, and completed an honors thesis on the “The Socio-Cultural Impact of Turkey’s Ban on the Hijab: The Case of Leyla Sahin.” Well-traveled, she has worked and studied in Western Sahara territory, Bosnia and Syria, where she worked closely with Iraqi refugees. Her career has focused on human rights, with specific interests in the MENA region and Central Asia, and in the fields of women’s rights, cultural/structural violence, and refugee rights. She began interning with us following a six-month stint at UN OCHA where she worked at ReliefWeb. Her critical thinking and commitment to human rights have made her a perfect fit with our team, and we’ve particularly appreciated the work she and Niki have put into refining the categories for the Handheld Human Rights map. In addition to Niki and Dragana, a team of students from an undergraduate course onDigital Media & __Global Developmentat the University of Maryland has been helping log incidents as well as blogging about the experience. Along with Niki and Dragana, these volunteers are really pioneering how human rights information can be placed on a visual map and timeline. We’ve particularly learned from the challenges they have faced along the way, such as shifting through long-reports in search of data, or deciding exactly where to map an incident with often limited information. These lessons will be invaluable as we move forward and expand the scope of Handheld Human Rights. 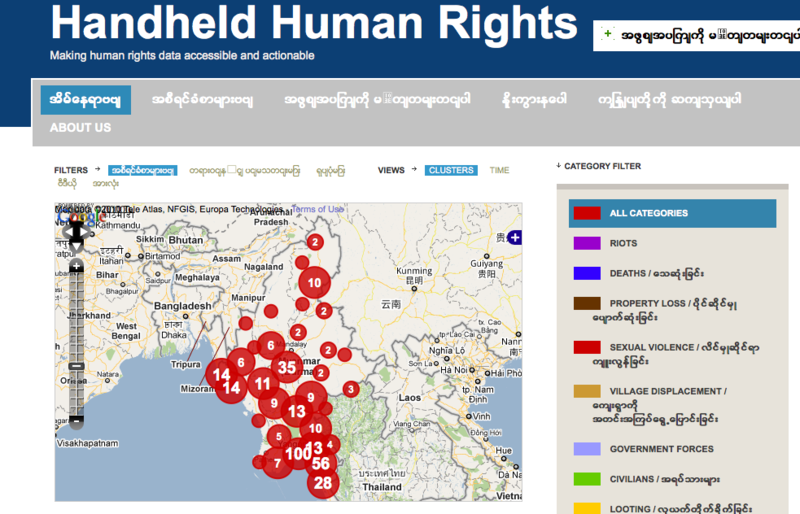 Finally, we owe our biggest thank yous to our Burmese friends who translated Ushahidi into Burmese, enabling HHR to be fully functional in the language (download the zawgyi font to view Burmese script) and most of all to the incredible coalition of human rights organizations operating around Burma’s borders. On a daily basis human rights workers risk their lives to report on the realities inside Burma’s many states and divisions. By mapping their information on this dynamic map, we work to honor their research by making it more accessible and actionable.